This month I have a couple of graphs to give you a visual for Q3 performance this year vs. prior years. 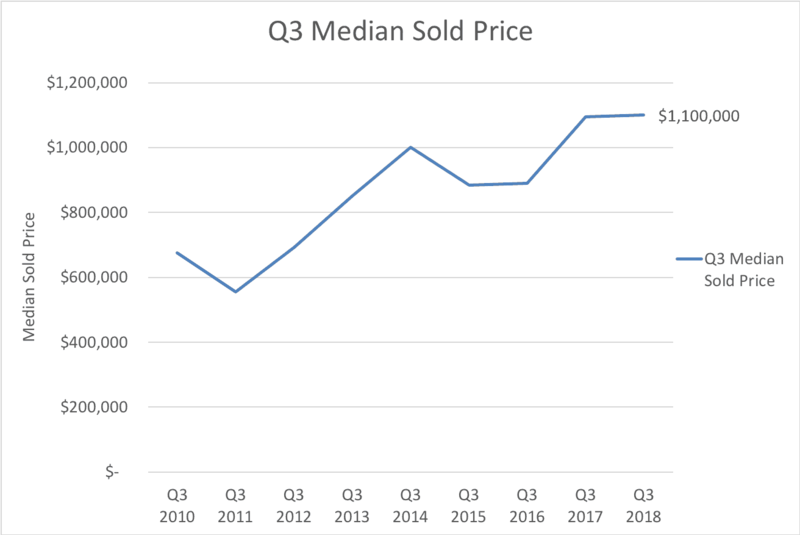 Median sold price of $1.1M in the 3rd quarter (July – September) this year slightly exceeded the same quarter in 2017 ($1.095M). This is similar to Q3 2015 vs. Q3 2016, which also saw modest appreciation. 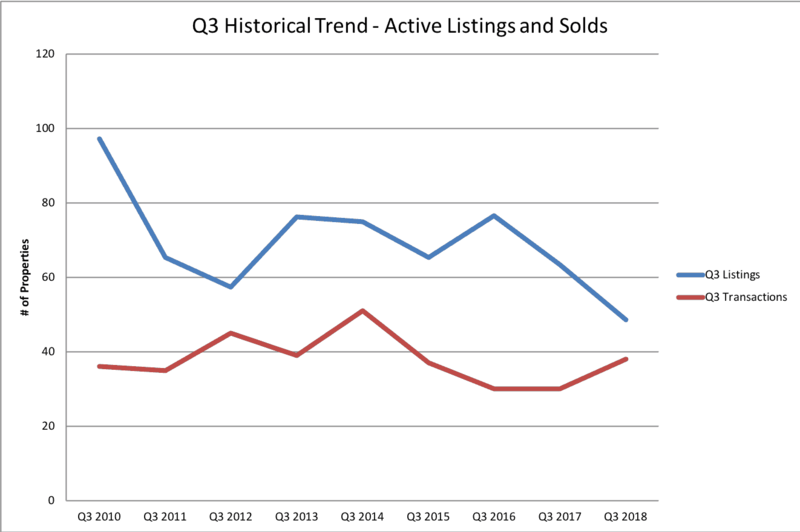 Looking at the data, it is interesting to see the continuing decline in the number of active listings: on average there were 49 in Q3 2018 vs. 63 in Q3 2017 (and 77 in Q3 2016). The number of transactions, though, was the highest in several years at 38. The median number of days on market for sold listings in Q3 2018 declined to 38 days vs. 80 in Q3 2017, and with strong demand and limited inventory, one might have expected to see year-on-year sold price appreciation be higher, but that was not the case. If you are thinking about making a change in 2019, feel free to contact me and I’d be happy to give you my opinion on the market value of your home, and can advise you on what buyers are looking for and what you may need to do to get your home ready for sale. Selling your home and making a move don’t have to be stressful if you are prepared and have a plan. Note: All data comes from the Austin Board of Realtors’ MLS report, reflecting activity through September 30, 2018.